To date, the Monad series on Stroboscopic Artefacts has presented a highly diverse selection of sonic experiences, presented in such a way that listening to the entire collection feels like watching an intelligent alien species’ audio documentary on our own planet’s life. 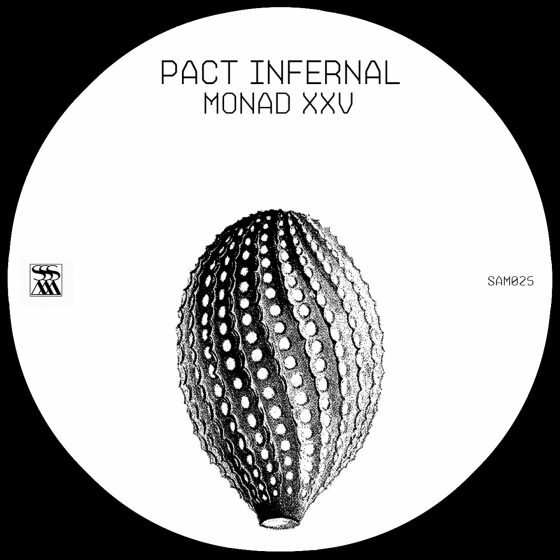 This commitment to diversity in creative approach and final results has meant not shying away from the so-called ‘darker’ or more intimidating regions of recorded sound, a fact that is perfectly exemplified by Pact Infernal’s new contribution to the series. With Lucy having already remixed tracks from Pact Infernal’s “Descent” EP on the Horo label, this enigmatic unit has officially joined the Stroboscopic roster for an outing that is sure to captivate bold sonic travelers (incidentally, this comes just in time to prepare listeners for Pact Infernal’s live set at Berlin Atonal later this year). Pact Infernal is an artist whose personal identity lies hidden behind symmetric, monochromatic regalia, and who provides a listening experience that might be likened to indoctrination into some hermetic order, or a training session for some potentially terminal mission…or maybe both. His past releases on the Horo label - including the bracing career synopsis “Infernality,” released this year on double LP - have painted a portrait of determinedness in the face of life-altering ‘threshold’ circumstances, and this new suite of tracks is no exception to that rule. The project’s music downplays some elements from the ‘harsh’ music continuum (feedback shrieks, deliberate ‘red-lining’ of the sound mix, etc. ), and chooses instead to build tracks around more widely applicable ideas: the idea that percussion is a universally recognizable condensation of willpower into audible expression, or that opening up a huge sound space can evoke simultaneous feelings of exhilaration and dread. The opening “Nitimur In Vetitum” demonstrates a distorted synth drone shining its search light into a place where omnipresent martial percussion and obscured traces of ceremonial chants suggest the worship of something truly sinister. “Cor Aut Mors” continues in this vein, with its metallic crash, slow fade-in, and distant animal call patiently building to create an atmosphere in which one wrong move may spell disaster. By the time this all coalesces into a mid-paced rhythm, it’s too late to escape from the hypnotic strands that Pact Infernal has woven. Students of history will know the name of “Sapere Aude,” as the unofficial motto of the Enlightenment philosophers: dare to know. Horace’s famous phrase is a good choice to welcome listeners into the vast expanses of audio space that the song’s convulsive, galvanized beat plows through. The closer “Capax Infiniti” with its hard-as-steel and nearly militaristic surge of intensity; is an experiment in percussive impact that has a certain timelessness to it despite its obviously modern design (listeners are just as likely to conjure up mental imagery of cohorts of Roman legions as they are the looming menace of attack helicopter squadrons). As a whole this new EP suggests a world where you are the master of your own destiny, but are never immune from consequences.